Come and learn how from some of the top experts in the world on how to use Internet Marketing & Marketing Partnerships to grow your business. At this event you will be welcomed with an amazing party followed by two intense day of interactive learning along with some of our best global partners & customers. In addition at the event you will have the opportunity to pitch your concepts and ideas to some of the best marketers on the planet. As a special bonus one lucky winner will win a Priceless Business Makeover from Powerteam International! The Ultimate Wealth Camp is A MUST ATTEND! Come join us for fun and prosperity at the Ultimate Networking Party on Sunday, July 29! To kick off the Ultimate Wealth Camp, we are having a VIP Summer Party on Sunday evening. Come and learn how you can substantially impact your financial future by connecting with mega successful entrepreneurs, learn how to make money on the internet and discover the power of global joint ventures! You will learn about new ways to make money as well as be able to share your great ideas with some of the top marketers in the world! Now it is up to you to take action and take control of your success plan. “If You are Ready To Be One Of The Lucky Few Who Take Advantage Of This Opportunity In History, Register and Plan to be in Chicago for the Ultimate Wealth Camp! Bill Walsh is the CEO/Founder of Business Coaching/Venture Capital firm Powerteam International. He delivers a message of transformation and practical applications through life stories that empower people to understand specifically what it takes to build successful companies. 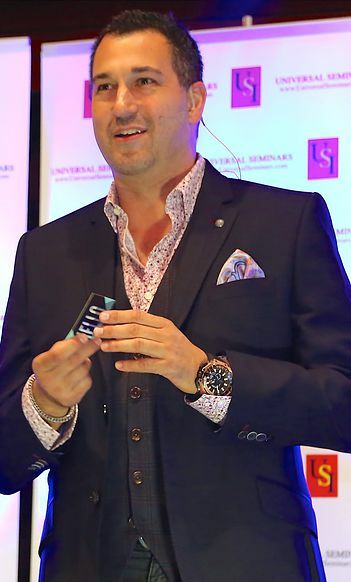 As an accomplished author, speaker, radio personality and movie celebrity, Bill has the background to connect instantly with the audience by sharing the mindset, methods and systems required to win really big in the current economy! For everyone that owns a business or would like to capitalize on the entrepreneurial dream, his message will enlighten them with knowledge and action principles to turn that passion into success! Bill has an extensive background in foreign currency trading, real estate development and building business in more than 30 countries. Over the past two decades, his firm has specialized in helping companies launch, grow and creating exponential valuation in the market. The Rainmaker Summit and WIN University programs offered through Powerteam are designed to assist entrepreneurs in creating the focus, plans and partnerships required to build multi-million dollar companies! Austin was born on the south side of Chicago. He is the son of Bill Walsh, world-renowned business and success coach, and founder and CEO of Powerteam International. At a young age, Austin was already instilled with the entrepreneurial spirit. By age 12, he began to DJ birthday parties and 8th grade graduation parties. He turned this into a successful business and started to become known for throwing some of the largest dance parties on the south side. On his 16th birthday, he threw a birthday party with over 600 in attendance with no entry fee. He turned around and in a month, had a New Years Eve Party with a thousand in attendance at $15 dollars a head.Austin found great success in the area of planning massive parties, and knew his experience and youthful advantage would lead him to his next great idea. He started teaching others how to use Social Media, such as Facebook, to grow their business. He learned ways to grow fan pages to a thousand plus people in a little over a week and keep the growth continuous. He then developed a monthly coaching plan to help entrepreneurs boost their presence on Facebook through fan pages. Some of his more known clients are people such as Mark Victor Hansen, Gary Goldstein, Matt Morris, Crystal Dwyer, Bill Walsh, and Marc Accetta. He continues to teach and inspire people younger than him, and has many plans for the future. He attended Roosevelt University in Chicago and continues to teach Social Media throughout both the United States and internationally. As a Speaker, Best-Selling Author, Motivator, Coach, a Mentor and a Corporate Trainer, Mr. Swanson has been an influence and mentor to thousands throughout the years since his early start in the industry over 15 years ago. Now Erik shares stages with many top notch Speakers and Authors including ones from The Secret, The Think and Grow Rich Society, and even the Millionaire Summit Tour. When Erik speaks, audiences are inspired, empowered, and entertained. His style combines step-by-step tactical teachings with humor and vivid story telling. Erik’s energy, warmth and authentic nature engages each audience member and allows participants to not merely observe and listen, but rather they will enthusiastically participate and be driven to action. He has developed his own unique and super rewarding system in which he calls “Secret Habitude Warrior” Training. Allow Erik to speak to your team, whether they are in sales, management, or your association of network. Erik is versed in many different styles and relates each of his stories and lessons relevant to your specific team’s needs. He has also implemented his Habitude Training to teach teens to develop the all essential habits of a great attitude and focus.